If you'd told me when I was ten years old that I'd someday be able to touch a moon rock, I'd have said "of course, because we'll all be able to go to the moonbase by 2000." I seem to be off by a few years. And I did touch a moon rock Sunday. 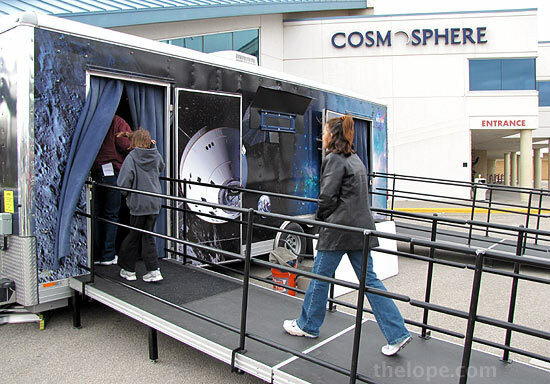 You can too if you come to the NASA Driven to Explore mobile exhibit parked by the main doors of the Kansas Cosmosphere and Space Center in Hutchinson on Monday, April 6, 2009 from 9AM to 5PM. Admission is free. The exhibit trailer is essentially an information/PR exhibit for NASA's planned return to the moon. It has been in Hutchinson since Saturday. The moon rock (atop the base to the left) is the star of the show - and it should be - given that it is one of only seven pieces available for the public to touch. It has seniority over most rocks on the surface of the Earth in that it is 3.75 billion years old. It is very securely fastened down and is protected from the top by the pictured plexiglass shield. 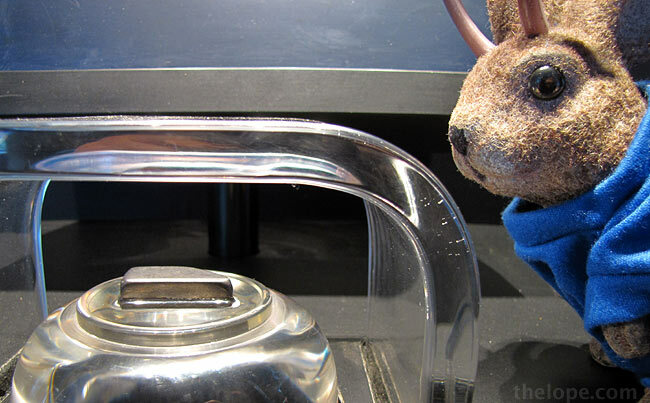 You can slip your fingers in under the shield and touch the sample, which is cleaned daily. What your fingers will touch is a small sliver (.7 oz) of 16.75 pound "lunar sample 70215,11" made of mare basalt. It was picked up by Astronaut Jack Schmitt during the Apollo 17 mission in 1972 - the last manned moon mission. Or rather I should say, Apollo 17 was the most recent manned moon mission as NASA does not intend for it to be the last. Exhibits in the trailer detail just how NASA plans for us to go back. 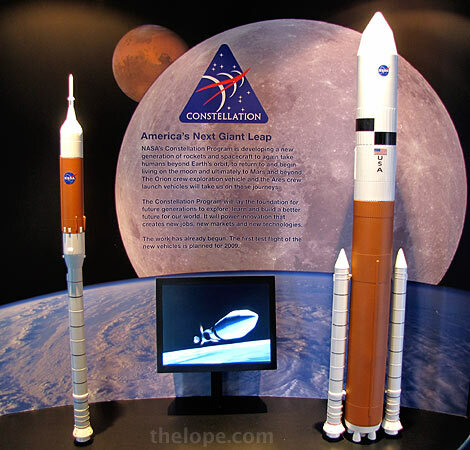 The model on the left represents the proposed Ares 1 rocket, which is designed to carry astronauts into Earth orbit in the Orion spacecraft, a descendant of the Apollo command module. The Orion would be configured to carry six astronauts to the space station or four on a lunar mission. Its thrust system combines the solid fuel technology of the space shuttle with a liquid fuel rocket. NASA plans call for the Orion to rendezvous with spacecraft carried into orbit by the much larger Ares V rocket (right). The Ares V would carry an Earth departure stage and the proposed Altair lunar descent module. Thus, instead of launching an all-in-one moon mission in one rocket as done with the Apollo program, NASA plans to send up larger components and more astronauts in two separate vehicles, which will then assemble for the trip to the moon while in Earth orbit. 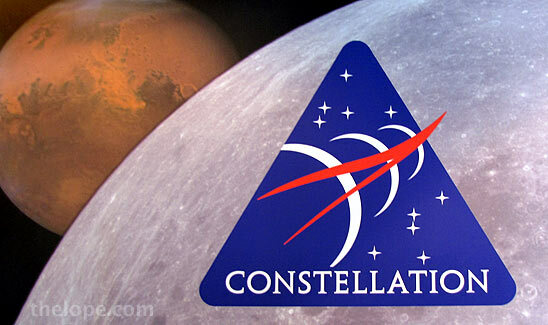 Both craft are under the umbrella of NASA's Constellation program. Check out the cool retro logo, by the way. 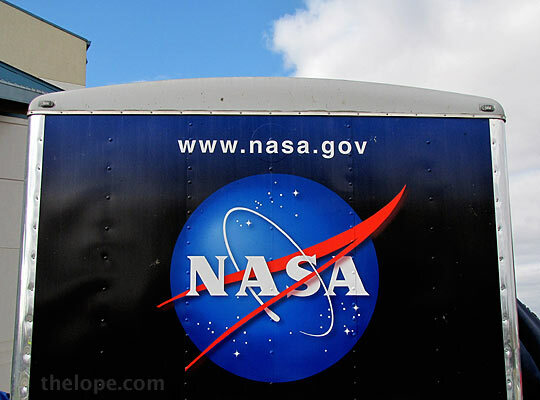 As an aside for aficionados of the retro-space look, take in the NASA logo on the end of the trailer. The logo, nicknamed "the meatball" dates from 1959 and was used until 1975, when an unfortunate decision replaced it with a less-dated - but very mundane - logo. The classic meatball logo was brought back in 1992 by administrator Dan Goldin as a way of reminding the public of the glory days of NASA. PR move or not, I'm glad it's back. As you leave the exhibit, an employee will likely offer to use a small cam to put your face in a a picture of a space suit helmet against your choice of several backgrounds. 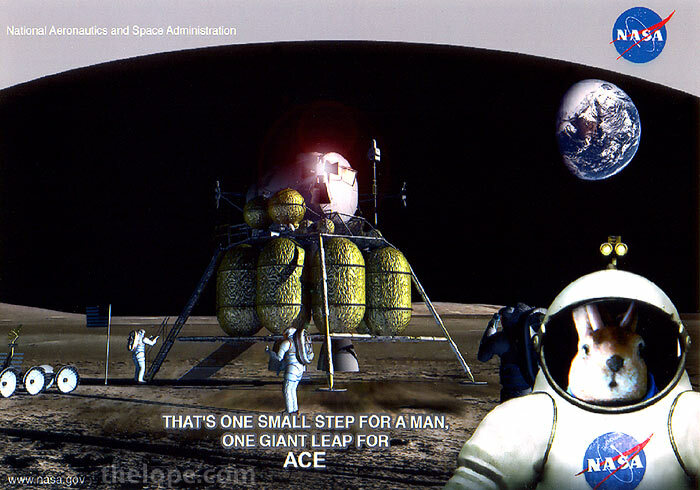 Ace chose the retro lunar module which looks like an artist's conception of the Altair. The picture is free, by the way, and they don't even ask for an email address with which to spam you. Also, there was a box of free plastic NASA visors just inside the door of the Cosmosphere. 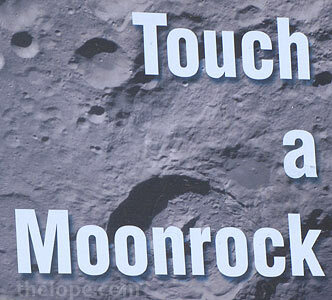 So, that's a free picture, a free visor, an educational exhibit and you get to touch a moon rock. Not bad; not bad at all. July 20 of 2009 will mark the 40th anniversary of the first manned moon landing in 1969. The Cosmosphere has a number of artifacts of that mission - Apollo 11 - including a moon rock, though you cannot touch it. See some of the Cosmosphere's Apollo 11 exhibits in a story we did in 2007 called Walking in Distant Footprints.